The SQ 10 can print instant photos in a 1:1 format, just like a Polaroid camera, but now also allows you to have digital copies of the same. Recently, we were playing around with Huawei’s P20 Pro — the world’s first smartphone with a triple camera setup and presently the only one to sport the best camera performance according to DxOMark. Our review too termed it as one of the best cameras you can find in a compact device, locking horns with the Google Pixel 2. The P20 Pro showed the amount of evolution that smartphone cameras have witnessed in the last few years. However, if you were in your prime in the last century, you would have been familiar with instant cameras — a must-have camera for every shutterbug in those days. While they have mostly vanished from the market — thanks to the modern digital age, Fujifilm is one of the few companies that has kept alive the nostalgia of old cameras with its range of Instax cameras. 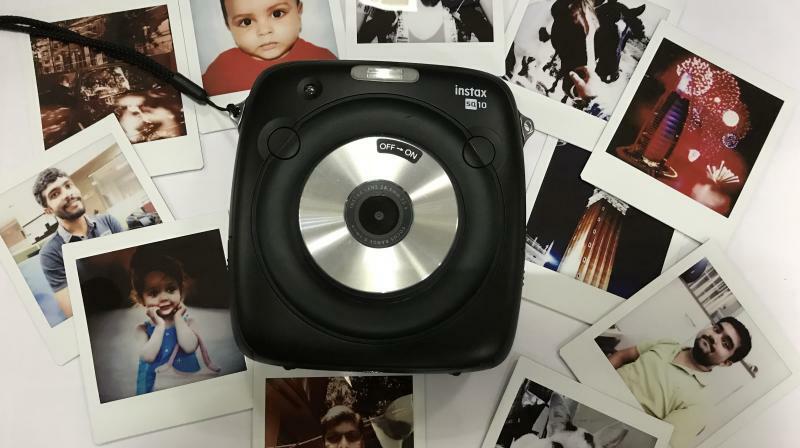 One of their latest ones to hit the series is the Instax SQ 10 which manages to strike a balance between the golden age of instant cameras and the convenience of the digital age. The SQ 10 can print instant photos in a 1:1 format, similar to a Polaroid, but now also allows you to save digital copies of the same on its internal memory or micro SD card provision. Sounds interesting? Yeah, but the asking price of Rs 19,000 for the camera and a single print costing Rs 100 seems to be too steep, especially when you consider that cheaper smartphones can do an equally decent job. 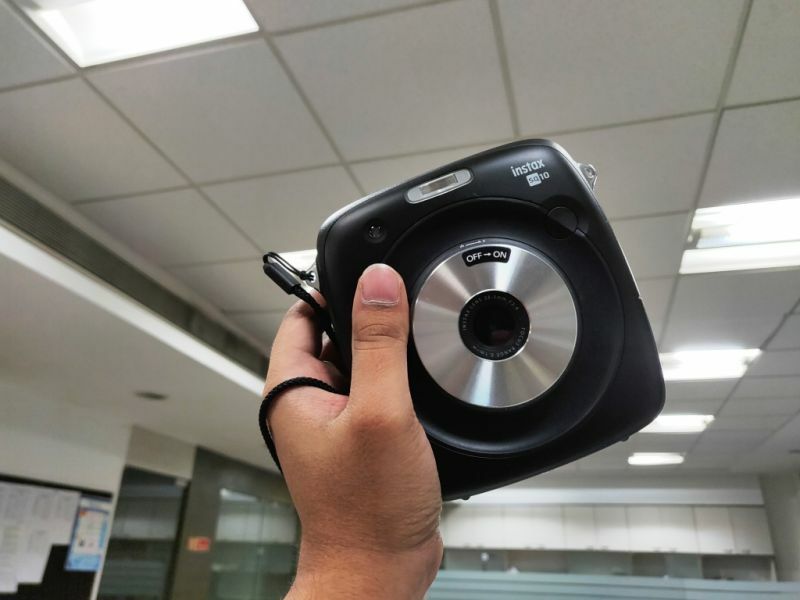 Therefore, is the Fujifilm Instax SQ 10 worth your attention? The first thing that you notice with the Fujifilm SQ 10 is its unusual, yet familiar shape — the square form factor with curved corners and a big circular lens ring in the middle, immediately resembling Instagram's logo. There’s a flash up front along with two configurable shutter release buttons situated on either side. Yes, you read it right — the two buttons make it super convenient to snap shots with either hand and also for clicking selfies. Lastly, the lens ring works as the power ON/OFF button for the camera. The rear gets interesting — there’s a 3-inch LCD display situated in the middle with a slew of buttons and a control wheel at the bottom. The controls include buttons for setting various parameters of the camera such as ISO, filters (there are 10 preloaded) and vignette effects. The wheel can be rotated to zoom in/out of photos. The rear panel is also home to the photo cartridge or cassette, which sits behind the display. A slider button opens the cartridge bay. Simply open the door, throw in the cartridge and you are ready to shoot. A physical slider switch on the left side of the camera allows users to choose between Manual/Auto modes. Manual mode allows for clicking photos and digitally storing them on the internal/external storage, while auto mode simultaneously prints the photos instantly. The prints exit from a slot on the top. The Instax SQ 10 is lighter than a conventional DSLR, but comparatively heavy too. It's very noticeable when you are carrying it around — its a bit bulky. Additionally, in an age where we are accustomed to seeing sleek smartphones clicking photos, the comparatively bulky SQ 10 is certainly an attention seeker. However, the rugged body, a good weight and well-designed grip areas make up for an ergonomic handling. However, extensive use with one hand does get tiring quickly since there is no proper grip for holding it for prolong periods with a single hand. 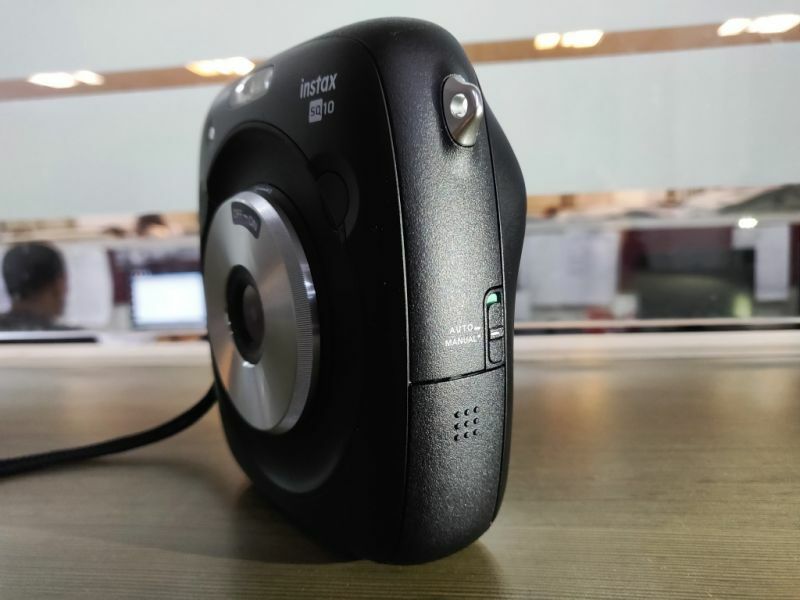 The Instax SQ 10 sports a ¼-inch 3.8MP sensor with a 28.5mm (35-mm format equivalent) f/2.4 lens. The digital images are rendered at 1920 x 1920 pixels whereas the prints are 800 x 800 dpi. This setup at first glance doesn’t assure a very healthy performance, which is actually the case with the SQ 10. Compared to the lightning fast snappers on smartphones, the Instax SQ 10 is noticeably slower. The shutter speed is slow, which works fine for broad daylight situations but gives up during low light and night time photography — all you end up capturing is light trails or blurred images in standard mode. Using the flash is the only option here. There are two additional modes for those moments when you want to show your creative side — the Bulb mode allows you hold the shutter button for a desired amount of time to get extended exposure. 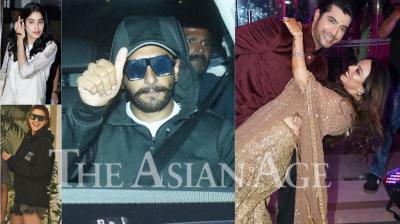 The Double Exposure mode superimposes a shot over another to provide you with a sort of Halo effect on your final shot. The autofocus system is fast enough to quickly alter the focal length according to the demand of the scene. Overall, the photos lack sharpness and details; however, the colour reproduction is very healthy. The 10 Instagram-inspired filters that you can apply once you click a photograph are basically milder variation of colour tones — no fancy AI stuff here like your smartphone. When you are snapping selfies, you will have to ensure that the surroundings are well-lit to get a snap that you can actually print. The SQ 10’s internal memory can only hold up to 50 images, which can be extended if you slot in a microSD card. If you want to print one of your stored photos, then all you need to do is go into photo options and select print. You can also click the dedicated print button for instantly printing the image. While printing, there’s an intuitive animation depicting the printing process (although it doesn’t happen that way in reality). Sadly, photos cannot be transferred outside the camera as the micro USB port is only meant for charging the battery and not for data transfer. If you want to export the photos, you will have to use a micro SD card to save your photos and use a card reader to get them saved externally. While the camera is meant solely for a single purpose — instant shoot and print — adding Bluetooth or Wi-Fi connectivity could have given the device additional bonus points. Share SQ 10’s photos quickly on social media could be a boon to those who own one of these. Well, maybe it would take away the nostalgic value from the product. However, one will definitely feel handicapped without the features in this given age of technology and vast connectivity options that most gadgets sport. However, for what it loses out on the image quality, it covers up for that with its ability to print your photos instantly. The camera can print up to 10 photos on a single cartridge. The photos are printed in an Instagram-style 1:1 format and are printed within seconds of your command. The photos measure 62 x 62mm whereas the film measures 86 x 72mm. The self-developing film renders photos within a minute to form on the sheet. The prints are sharp and clear, but bog down in colour accuracy — it can be used as best for pasting it in albums or using it for quick gifts and memories. 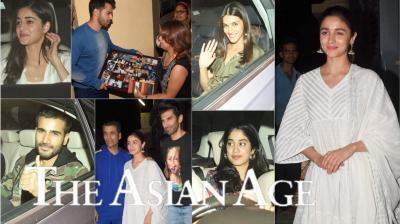 One can even print up to nine images in the form of a grid on the film. However, the prints aren't cheap — a cartridge with 10 sheets will cost you a whopping Rs 3,600, which is pretty expensive than snapping on your smartphone. Additionally, if you accidentally open the cartridge case while the cartridge hasn’t finished, you ruin the rest of the blank sheets. As for the battery, Fujifilm supplies with an unspecified sized Lithium-ion battery, which is good enough for snapping up to 100 photos at a stretch. One can charge the battery via micro USB cable under an hour and a half. 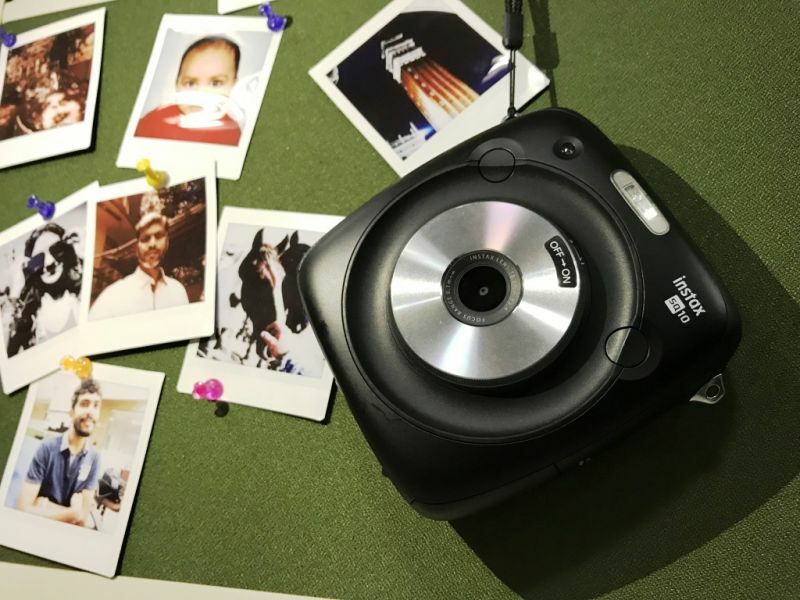 The Fujifilm Instax SQ 10 comes across as novelty product for those who want an element of nostalgia into their casual photography efforts. 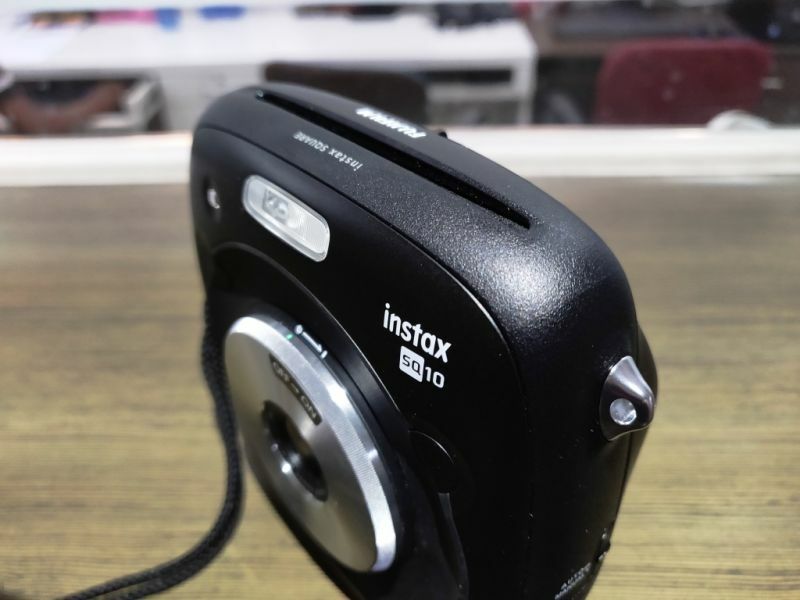 However, if you are well accustomed to the luxuries of 21st-century technologies, then the Instax SQ 10 makes no sense being in your bag at all — it’s slow and takes inferior pictures compared to smartphones today — and also requires the user to possess an immense amount of patience to get the desired shot. Add to that the lack of any wireless connectivity and you are essentially left with something that is good enough for seeking attention on the streets, especially when you consider the extremely steep price for both the camera and the films. In fact, we found those moments extremely rare when we felt the need to take out the Instax SQ 10 instead of our smartphone. However, with a little survey around the place with local dealers, we did find that the product has many takers. Strange enough for us, we probably under estimate the spending crowd out there. 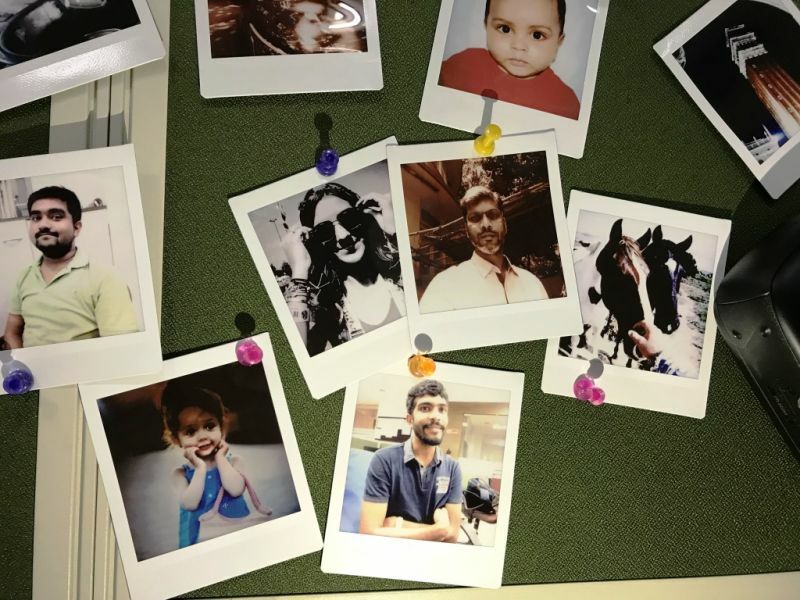 The Instax SQ 10 will appeal only to those who like to have instant memories on paper instead of their smartphone galleries. 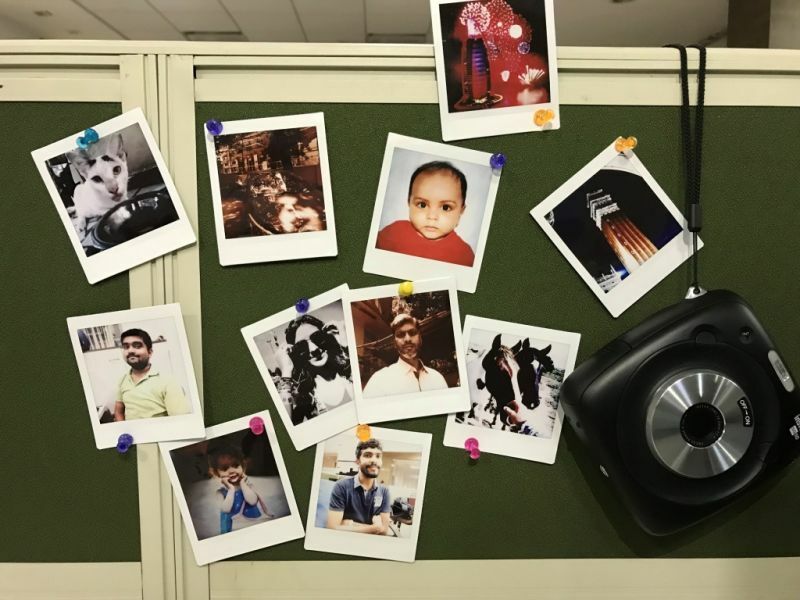 If you are someone who decorates his/her cubicle or study table with memories of special moments in printed formats, then probably the Instax SQ 10 will appeal to you. 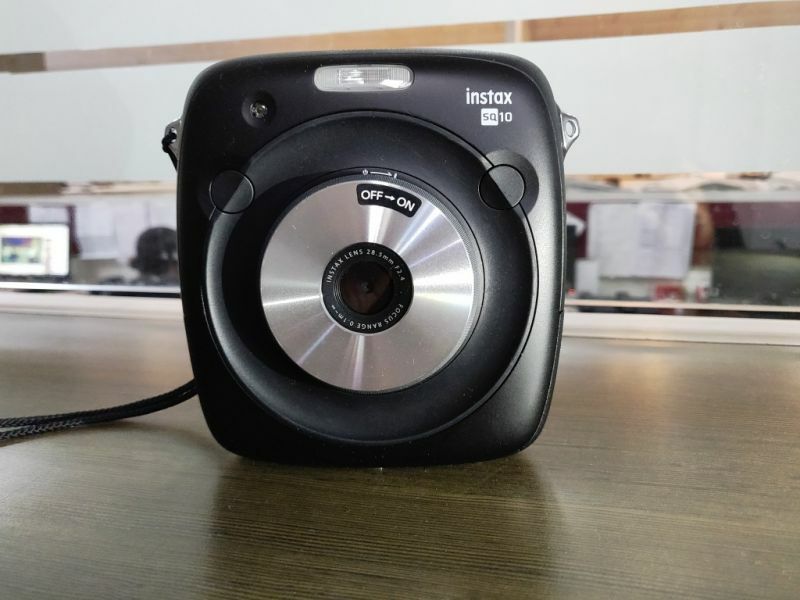 If you don't care about the huge price per photo and the camera, then the Instax SQ 10 is definitely recommendable for the luxury of instant photos. 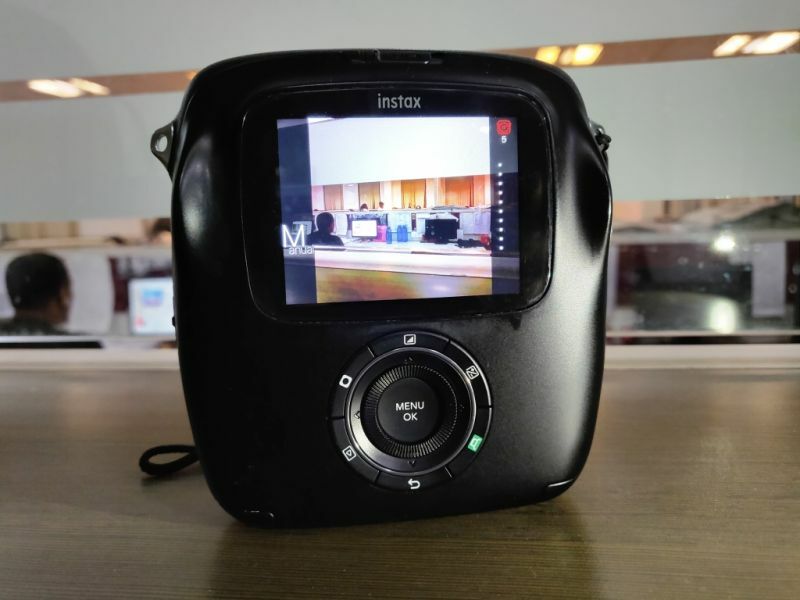 However, if you really are looking for a camera that takes impressive Instagram-worthy photos, you will be better off in investing in an expensive smartphone with capable cameras and opt for a printer at home.